– King Philip scored inside the first and last five minutes of the match to earn two points at home and keep its postseason hopes alive. Senior captain Ian Zimmerman gave the hosts the lead in the third minute, finishing off a cross from classmate John Cullen. Cam Lawrence added the insurance tally in the 75th minute, scoring on a volley on an assist from Gavon Fox. Aidan Lindmark made four saves to record the shutout. – After a scoreless first half, Ally Stanton broke the deadlock midway through the second half off an Avery Snead assist. Erin Quaile equalized for Franklin just four minutes later off a Carly Alston assist. Breanna Atwood made nine saves and Taylor Butler made five saves for the Warriors, as both teams earned a point. Golf = Franklin @ Oliver Ames – Postponed to a date and time to be announced. 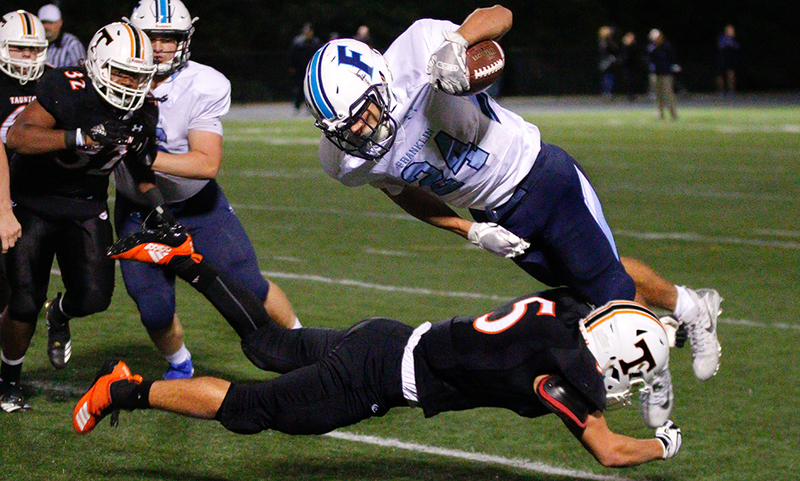 "Heading into Friday night’s contest against Taunton, Franklin head coach Eian Bain wanted to get as many of his skill players involved as possible to keep the Tigers’ defense guessing. “We got off to a very fast start and I thought we executed the game plan really well,” Bain said. “We try to think about players not plays so we wanted to get certain kids to touch the ball. We had a lot of different kids touch the ball tonight and that wasn’t by accident."